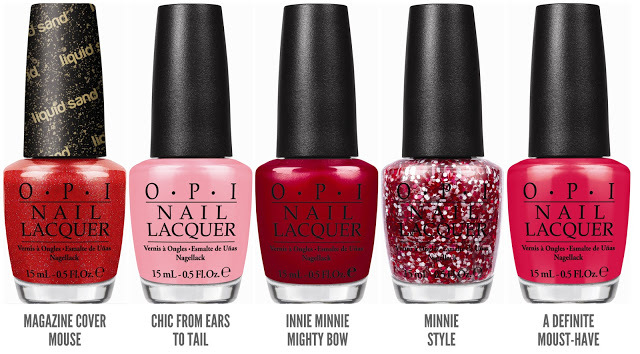 OPI has launched recently another amazing blend of girly fabulousness with their newest nail polish collection – Couture De Minnie. And Minnie Mouse is love! Always. That’s why this new set of Minnie polishes from OPI adds new excitement to Elite Nails Spa lovers and to Minnie Mouse fans too of course. The new set includes 3 shimmer, an awesome glitter and another Liquid Sand polish. Again, this edition inspired by Disney’s popular mouse is much of a red and pink shick. If you hadn’t had the chance to see and try the first edition, you can read back at this post – Who wants a MInnie cure? Let’s take a closer look at this 2nd edition of Minnie Mouse’s lovely swatches. Magazine Cover Mouse is a gorgeous red. Those who have fancy for textured polish will surely love this one. Minnie Style is red, pink and white glitter in a clear base. The big glitters would go really great with nail art. A Definite Moust-Have is a bright medium pink with some red and coral undertones and subtle silver shimmers in a pearly finish. Innie Minnie Mighty Bow This shade is more like Candy Apple red with strong Red and Golden micro shimmer for added dimension. The glitters will be best to wear too on Holidays. Chic From Ears To Tail – A pop of bubblegum pink is totally fabulous with a very a very subtle silver shimmer. 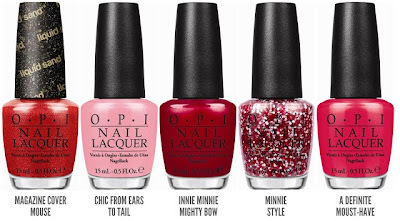 The Couture De Minnie nail lacquers also feature OPI's exclusive ProWideTM Brush for the ultimate in application. Remember Liquid Sand lacquers should always be worn without top coat. Great news! This limited edition collection is now available at Elite Nails Spa! Join the club and wear Minnie to your nails today! To know more about the latest nail polish available and updates, like us on Facebook and follow us on twitter too.